Today was a quiet day around here, the sun was shining but the air was cool and the wind was not making it any warmer. Hubs got the bicycle out then decided no it was too chilly, good thing because I was not riding and freezing, I have been cold all winter and spring is not coming any too soon for me. I have a few things to show you but did not include them in my previous Gingersnap Fan Challenge, I like to try not to have too much to say when it comes to the challenges. 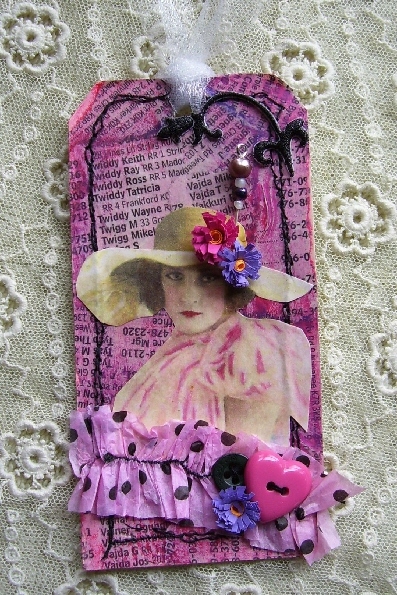 The tag is for a Bella Challenge using this beautiful lady with the hat image, given to us to use by Gecko Gals. We were to use the image in any way we like but on a tag, so I used some phone book paper and attached it to a manila tag with Modge. Allowed it to dry which didn't really take too long. I then scribbled some purple and pink oil pastels on the paper randomly and then blended it with my fingers. I used a tissue to take off some of the pastel colour here and there to give some highlights to the background. I then used black stitching all around the tag. I then coloured the woman with some coloured pencils, her colours were faded looking. I used some black to accentuate those beautiful eyes. I added a hat pin I made and some quilled flowers. I stitched on the machine some tissue using a large stitch then gathered it very carefully then added some buttons from my stash. I also used some organza ribbon for the top. This was fun and loved all the colours and the stitching is what made if for me. Oh and I forgot after I blended the pastels I sprayed a bit of hairspray to fix the oils. Works like a charm and they stay put. My next item is a card for the Inkurable Stampers ATC swap that Sarah Schwerin is hosting. Sorry but not being able to link up but Blogger is acting up. You can find Inkurable on my sidebar and you can find all the deets there. Back to the ATC. We are to use the 3 colours that the Blog colours are and so they would be orange black and white. Oh boy this should have been a challenge but after thinking about it awhile this is what I came up with. And of course you have to incorporate a stamp or stamps into the ATC. And you must make 9 of them exactly the same. Oh boy another challenge, I don't really like to make too many of one thing, that really doesn't make it all that original anymore one of my artistic motto's, never do too many of one thing and if you do change it up a bit so each one is slightly different. Not in this case. I used an embossing folder on black card stock and then cut and fit it onto the slide then inked the surface with white ink. I inked a butterfly corner stamp using Black Soot DI then used a black marker to make a border. Using 2 different Studio G stamps I stamped the butterfly and the flowers in StazOn on acetate. I then added some stickles to the butterfly and set all 9 of them aside to dry. I then used Marmalade DI on the white background paper behind the acetate and spritzed it with water to make the ink run and move for a marbled and interesting effect. Set all 9 aside to dry. Then I stamped in black on white card stock 18 flowers and then coloured them all using orange colouring pencil and centers with black. I then cut them all out and wanted to stack 2 for each card for a bit of dimension. I put a piece of foam tape between the flowers to lift them up a bit. Then I added stickles to the top flower for some bling. I then assembled everything and this is what I came up with. Best part of all is I end up getting one in return. I must mail these to Sarah soon as they have to make it to Australia where she will take all the ATC's from everyone and swap them so everyone gets a total of 9 cards back. And that is it for now. Thanks for looking. I hope you all had a wonderful and meaningful Good Friday. Hi Les. Your tag is absolutely gorgeous. Love the colours and all the textures. 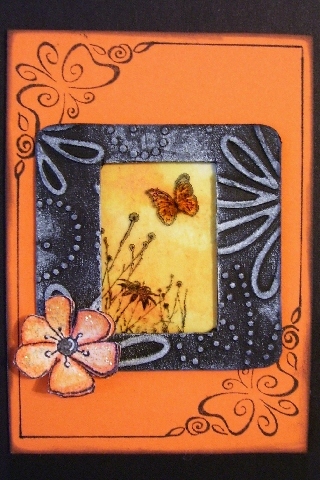 Your atc is fab...love the frame with the garden/butterfly. I have just about finished mine for the swap too. oooh both are lovely les.....hope i get one of your inkurable ones !!!! Love them all. Very creative Les. Hi Lesley yikes I had better get cracking onto my ATC swap. Yours look amazing!